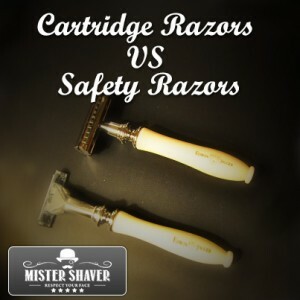 Cartridge Razors VS Safety Razors. Which Type Of Shaving To Choose? The debate goes on with people taking sides based on their experience of using safety razors or cartridge razors. We’ll have no debate here, but we’ll only provide you with information about both the razor types so that you can make a decision. A cartridge razor has handles made of plastic which requires that the person using them exert a pressure when shaving. This type of razor works by using its hinge to provide a constant angle throughout the shave – and this is one of the greatest aspects of the cartridge type razors that make shaving quick and easy. However, there a problem when it comes to the blades; it has a complement of multiple blades that are located exceptionally close together. This prevents the razor from cleanly cutting the hair in just a single pass – several passes may even be required depending on the thickness of hair. As the blade passes along the skin, it can catch and pull stubble. Not only this, but the razor tends to clog several times during a shave due to such a close proximity of the blades. Whereas safety razors are concerned, they do not require as much pressure during the shave, thereby saving the person of going through the ordeal of irritation. The single blade of safety razors makes clogging almost a non-existing phenomenon. The blades of a safety razor cost much less than cartridge razors, so the cost, in the long run, is less when a safety razor is used. Gillette – Gillette, or The Gillette Company, as it was known when it was founded in 1901, are among industry leaders when it comes to offering shaving supplies. Gillette is known to make some excellent cartridge razors such as the Mach 3 series. Schick – Schick is a brand by Wilkinson Sword. Founded in 1926, they have been offering some of the finest cartridge razors including Schick’s Hydro series. Merkur – Merkur has established its name as being one of the best providers of safety razors in the world. Their products range from classic heads to adjustable butterfly heads. Parker – Parker is famous for manufacturing handmade razors and other accessories. They offer a unique collection of razors whose handles are made from metal, horn, stone, and wood. Edwin Jagger – Edwin Jagger has set some of the highest standards when it comes to male grooming. With over two decades of experience in grooming products, they have some exemplary products to offer! When choosing between the two types of blades, you should be aware of the fact that cartridge razors are comparatively cheap to acquire, but the long-term expenses are greater due to the high cost of cartridges. However, when safety razors are concerned, the initial cost may be higher, but you’ll save a lot in the long term due to a low cost of the blades. As for Mister Shaver’s recommendation then here what I’ll tell you. Personally, I do use both types. I mostly use my Parker Long Handle safety razor but for quick shaving (when I have only about 10 minutes to shave) I use my Gilette Fusion Proglide. What type of razor do you use? I’d like to hear your opinion here in comments. I personally use the Merkur Safety razor I like it because it works great with my sensitive skin. i am trying different blades, i heard that Feather and 7 O’Clock shadow are the best so far. The weight and balnace of my Parker is excellent. Hanging upside down in a stand dries the not much quicker. It is a much nicer brush than the art of shaving badger that comes in there kit! It is almost impossible to find great razor and brush in a shaving kit. It is much better to buy them separately. It’s a bit more expensive option but it worth it. Use of a safety razor with a quality shave soap and brush will beat a cartridge razor every time. A safety razor will provide a closer shave, lead to better skin, and save you money over using cartridge razor systems. Totally agree with you, Matt. almost 2 months and I have a heavier beard. Cost wise at 12 cents a blade, changing blades twice a week would cost me a third the price of the Hydro at 2.75 per cartridge and I would have fresh blades. Shave quality is excellent with the DE also. According to me cartridge razors are not so bad because now a days their blades are having aloe and vitamin E which is good for skin.they doesn’t cause irritation. I clearly see that cartridge shaves closer and much(!) faster. And the irritation caused by DE shaving is approximately same, so there’s no reason to spend money on brushes, foams etc. The only real plus of DE razor is blade’s low cost. But when you factor in time wasted on shaving (15 min instead of 5 min) – it won’t look so bright, unless your time worth nothing. Also it’s not true, that DE razor last long but cart. razor will last “several years”. On the contrary – cart. razors last practically for decades, mine is from a dozen years ago and I know other people also don’t change these razors on a regular basis. But modern DE razor is just cheap pot metal. It can brake by itself, just from usage, and it can brake from falling on a floor. The internet is full of claims that companies aggressively advertise cartridges, and, allegedly, that’s why DE had gone out of fashion. Well, I see that DE shaving is advertised across the net quite aggressively. When you google something about shaving you will easily find articles like this one above. It won’t help, I think. DE shaving just technologically inferior and will remain just a hobby, it isn’t practical. I was wrong, the skin problems indeed decreased since I started experiments with DE! DE razor allows me to shave 7 days a week without ever feeling face soreness. Other arguments still stand though. In my experience, a DE razor provides a superior shave to a cartridge. With one or two-day’s growth, a cartridge is serviceable. Beyond that, it just does not cut hairs with any sort of efficiency or comfort. The DE- on the other hand, slices through hair like butter regardless of length. Thus, making the shave much more efficient. I can also attest that my skin feels much better post-shave with a DE than it ever did with a cartridge. I have solely used a safety razor for about 5 years now. I have used razors by Lord, Feather, and Parker. They all gave a good shave, yet had a short life span. About two years ago I found a Bigfoot Shaves razor, and since then, it had been my standard razor. At this point; since I have built up a technique with a safety razor, I won’t, for several reasons, go back to a disposable one. One discovered benefit to a safety razor is the availability of different blades. They all have different levels of smoothness and sharpness. So, by trial and error, you can find your preferred blades.